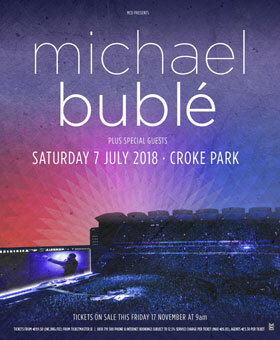 We’re excited to announce that Michael Bublé will be performing on July 7th at Croke Park in Dublin, IE and on July 13th in Hyde Park in London, UK! These are the only 2018 shows that will be in the UK and Ireland! General onsale begins Friday November 17th, 2017 at 9 AM GMT. For priority access to both pre-sales, join Michael Bublé’s official fan club, Bungalow-B. 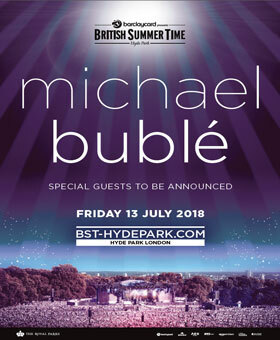 The Bungalow-B Fan Club pre-sale for London, UK at Hyde Park will begin today, November 13th at 9 AM GMT and end on November 17th at 9 AM GMT. The Bungalow-B pre-sale for Croke Park in Dublin, Ireland will begin on Wednesday November 15th at 9 AM GMT and will end on November 16th at 9 AM GMT. Bungalow-B Members can purchase up to 4 pre-sale tickets for each pre-sale. PLEASE NOTE: Tickets are limited and Bungalow‐B members are strongly advised to purchase pre-sale tickets as soon as the pre-sale begins. Bungalow‐B members are not guaranteed tickets, all tickets are served on a first come first serve basis.